Does filling out loan applications sound like your idea of kid-friendly fun? Probably not, but it fit right into the idea behind La República de los Niños. Literally translated as "The Children's Republic," the child-sized Argentine theme park was a product of the Eva Perón Foundation, run by the wife of populist authoritarian President Juan Domingo Perón. Created to teach Argentinean youth about the virtues of democracy, young visitors to the park can elect their own congress and haggle with banks over imaginary loans. With its tall spires and bright colors, the park almost looks like the original Disneyland. 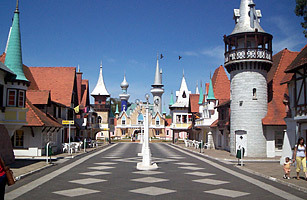 Indeed, the park's management claims to have inspired Walt's own creation, but that is a dubious claim as there is no evidence of Walt ever visiting or having knowledge of The Children's Republic, even if Disneyland opened just three years after the Argentine theme park welcomed its first batch of budding civil servants.